As I recall, Sonic the Hedgehog has been on his last leg for many a game. He's been as washed up as Crash Bandicoot - almost to the point of death. But all I can say is that if Sonic has been dead for the last few months, he's now been reincarnated as the star he once was in the new DS game, Sonic Rush. It's not easy reviving a sagging career, but the good folks at SEGA have come to their senses and have realized they don't really want to go down with their flagship mascot - it's so hard to get a new one to stick. So they put everything they had into this new Sonic game and they have come up with an instant classic. This game is well done and even though I have played it for two days straight, there is still more to see and do. Sonic Rush is a fast, frenetic action platformer that blends old-school, 2D sidescrolling with cutting edge 3D graphics that the GBA could only dream of rendering. It's loaded with ramps, jumps, loops, trampolines, corkscrews, rails to grind and of course rings that must be collected and protected. Booby-trapped environments are out to get you with spikes, precarious ledges and various enemies blocking your path. Sonic has joined forces with a cool queen from another dimension. Blaze is her name and she's literally giving Sonic a run for his money. She's just as fast and agile as Sonic but her levels are part of another dimension. Both of them are searching for stolen emeralds. They must race through each level as quickly as possible and collect plenty of coins in the process. Both characters are playable and offer a good range of gameplay diversity. Dr. Eggman is back and this time he's double trouble as he exists in both universes. The pace of the game is incredibly fast and the developers have designed the levels to accommodate the dual screen features. The levels are displayed more vertically than the traditional horizontal presentation as both screens are utilized at the same time. The top screen displays the top of the level and bottom displays the lower part. Despite the dead space that separates them you never lose sight of the little critters. It does get a little confusing when the character exits to the right of the bottom screen and appears on the left side of the top screen. The paths are designed to follow this direction and once you get used to it does feel pretty natural. The scenery does scroll which eliminates a lot of confusion. If you're familiar with the whole Sonic bag of tricks you'll feel right at home. Even the rail grinding is included. By pressing the D pad and the button you can perform a series of skateboarding-style tricks that will fill up your boost meter. Not only will you increase your pace to warp speed but you will carry enough momentum to plow right into an enemy and really mow him down without losing any rings. This is a great feature that really keeps the excitement of the game at peak levels for longer durations. Boss battles are in 3D and only utilize the top portion of the screen. There is a half-pipe level which is also in 3D and it's the only significant element that utilizes the touch feature. The standard button controllers do a great job at any rate. They are tight and very responsive. The graphics are bright, colorful and nicely detailed. Even in the 2D levels you can see some nice depth and dimension to the backgrounds. Considering the incredible speed of the game the DS manages to keep up and you will always have at least a split second to make a decision. Multi-player modes can be played with single or multiple cards. They are mostly races and also only use the top screen. 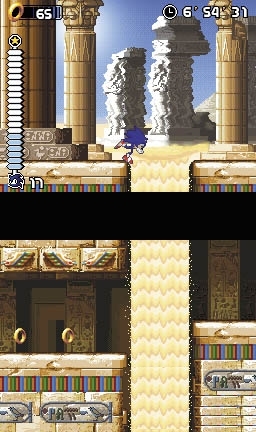 The bottom screen shows the progress of the other players on a map. It's amazing how much more quickly you can get through a level when you're under pressure. Practice doesn't hurt either. Sonic Rush is a solid action game that is bound to make some reviewer's DS game-of-the-year list. It should definitely make your Christmas list. It's hard to believe that even just 5 years ago it was pure fantasy to imagine playing a Sonic game on a Nintendo system. How times have changed. Sega's decision to abandon their hardward development and focus entirely on their software has lead to some strange partnerships that would have seemed impossible back in the hey day of the 16 bit wars. For example, Sonic has now appeared on every major game system available including the fledgling Nokia N-Gage and now Sega is readying his appearance on an entirely new platform. The screenshots shown here were taken from the demo seen at this years E3. Although it's definitely a work in progress it's obvious that Sonic Team is going to pull off a very detailed 3D Sonic game in the near future. While not much is known about the game, we do know that moving Sonic will require zipping your finger across the DS touch screen in a rapid fashion. Jumping or spinning controls aren't known at this time. The biggest hurdle the DS faces is introducing gamers to an entirely new control scheme. Many games in development for the DS tend to be forgoing the classic D-pad and button configuration in favor of the touch screen and stylus input. While we applaud innovation we also have our reservations regarding the DS interface. Will gamers accept an entirely new way of playing games or will it be merely seen as a gimmick? In the Sonic scenario, gamers have just become used to moving him around at incredible speeds in 3D; will they easily grasp the idea of using their fingers rapidly on a small screen to facilitate movement? Time will tell.